Ever since the Hamas takeover of Gaza in June there have been effectively two governments in the occupied Palestinian territories. In Gaza, Hamas, the Islamist militant movement, says it is the legitimate government, democratically elected by the Palestinian people in 2006. But Palestinian Authority President Mahmoud Abbas has accused Hamas of staging a violent coup and has appointed his own emergency cabinet. Mr Abbas is also leader of Fatah, the mostly secular and nationalist faction that dominated Palestinian politics before Hamas's election victory. For now the two governments are charting separate courses - and the chances of an immediate rapprochement seem slim. In the West Bank, Mr Abbas is being embraced by the international community. The economic embargo against the West Bank imposed on the previous Hamas-led administration has been lifted. Israel has released some of the custom revenues it collects on behalf of the Palestinians to the new emergency government. It has also promised to release 250 Palestinian prisoners to try to bolster Mr Abbas. The hope among Israeli officials and foreign governments is that Palestinian support for Mr Abbas will grow if he can deliver improvements in the quality of life of people in the West Bank. But there are questions of legitimacy over Mr Abbas's new government, which was appointed by presidential decree, and has not received the backing of the Palestinian legislative council, which is dominated by Hamas. Hamas has called for dialogue between the two sides on forming a new unity government, but this has been rebuffed by Mr Abbas. He insists that the situation in Gaza must be reversed. Many senior Fatah officials were killed or forced to flee Gaza by Hamas. Perhaps most importantly, the international community and Israel have been putting put pressure on Mr Abbas not to engage with Hamas again. Israel said that it will cut all links with Mr Abbas if he invites Hamas back into the government. For the immediate future it seems unlikely that Mr Abbas will change tack - his stance seems popular among many in the West Bank. A recent poll conducted by Near East Consulting, a polling organisation based in Ramallah, said Fatah would receive 41% of votes if an election was held today compared to 15% for Hamas. But in Gaza, it is an entirely different story. The economic and political embargo of Hamas remains and is deepening. 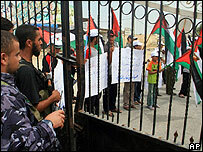 The international crossing from Gaza into Egypt at Rafah remains closed. The Islamist movement refuses to recognise Israel or renounce violence. While humanitarian aid is getting into the territory, the main goods crossing into Gaza from Israel has been closed for over a month, further crushing Gaza's already-weak economy. According the Palestinian Trade Centre and the Palestinian Federation of Industries, 80% of industrial businesses have been temporarily shut over the past month and at least 65,800 employees have been laid off. Muhammad Talbani, owner of a biscuit factory in Gaza, has stopped production, depriving more than 350 people of work. "I feel very bad when I see that my machines are stopped," he says. "It's not normal." The Hamas takeover of Gaza has scored one noticeable success - it has restored a degree of law and order to the previously lawless territory. But it is difficult to see what else Hamas can achieve if it is being isolated on all fronts. "The establishment in the West Bank think that they can squeeze Hamas and that they might crumble in a few months," says political analyst Ali Jarbawi. "The best thing is to have dialogue between the two sides. But what's right and what makes for good politics are very different things." But what are the chances of getting the two sides together? Many Palestinians believe that Fatah and Hamas will ultimately need to resolve their differences. The goods crossing into Gaza is an example. Israel will only reopen the terminal if Fatah-affiliated forces patrol the area as they did a month ago before the Hamas takeover. While Mr Abbas seems in no mood to speak to Hamas, he does not want to be seen to be punishing the 1.5 million Palestinians in Gaza. "The events in Gaza are still only a month old," says political analyst George Giacaman, of Birzeit University in the West Bank. "It is still very heated. But I think in the coming months there will be growing pressure on Mr Abbas to speak to Hamas."